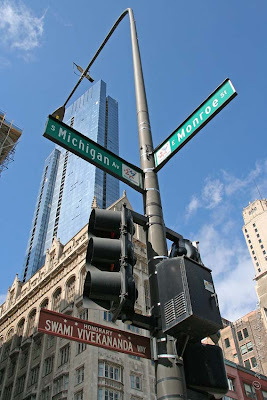 "On November 11, 1995, the stretch of Michigan Avenue that passes in front of the Art Institute was formally conferred the honorary name "Swami Vivekananda Way"..
"It fills my heart with joy unspeakable to rise in response to the warm and cordial welcome which you have given us. I thank you in name of the most ancient order of monks in the world; I thank you in the name of the mother of religions; and I thank you in the name of millions and millions of Hindu people of all classes and sects. My thanks also to some of the speakers on this platform who, referring to the delegates from the Orient, have told you that these men from far-off nations may well claim the honor of bearing to different lands the idea of toleration..."
The World Parliament of Religions was sponsored by the Unitarians and Universalists of the Free Religious Association, and was a part of the greater Columbian Exposition held for several months in 1893, in Chicago, which was attended by over 27 million people. 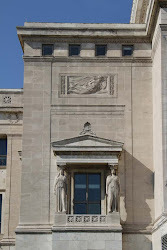 # Continue reading.. Swami Vivekananda at the Parliament of Religions.. click here .. 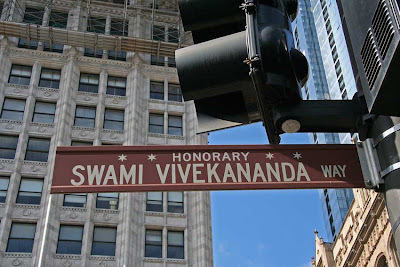 Check out on You Tube..
Swami Vivekananda Speech at Chicago..click here ..